Fate throws young African refugee Idrissa into the path of Marcel Marx, a well-spoken bohemian who works as a shoeshiner. With innate optimism and the unwavering support of his community, Marcel stands up to officials doggedly pursuing the boy for deportation. Le Havre is a film written and directed by Finnish filmmaker Aki Kaurismäki, his second French film. 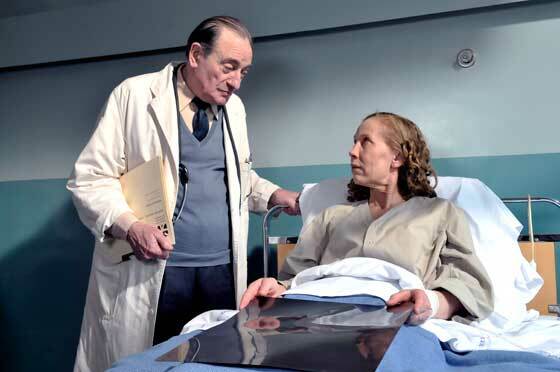 It premiered in competition at the 2011 Cannes Film Festival, winning the FIPRESCI Prize. 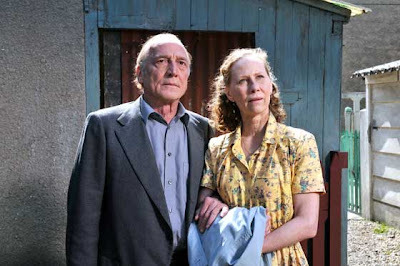 It is also Finland's official entry to the 84th (2012) Academy Awards for Best Foreign Language Film. 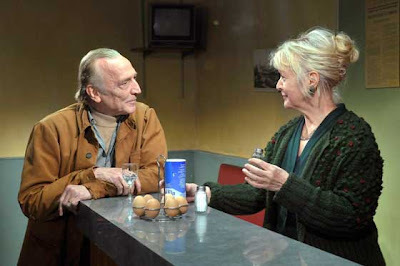 A loose sequel to his 1992 film La vie de bohème, this one continues the story of one of its central characters, Marcel Marx (once again played brilliantly by André Wilms), a failed writer who is now a shoeshiner scraping out a modest life with his wife Arletty (Kati Outinen) in the Northern port city that gives the film its name. 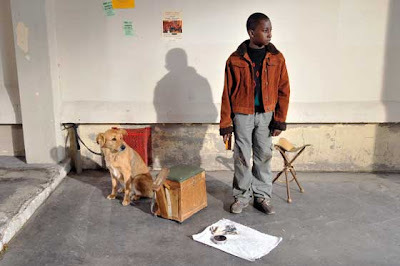 Following an encounter with Idrissa (Blondin Miguel), a young African refugee on the run from the immigration authorities and lead investigator Monet (Jean-Pierre Darroussin), Marcel and his neighbors open their doors to the boy and help him make his way to join his mother across the water in London. 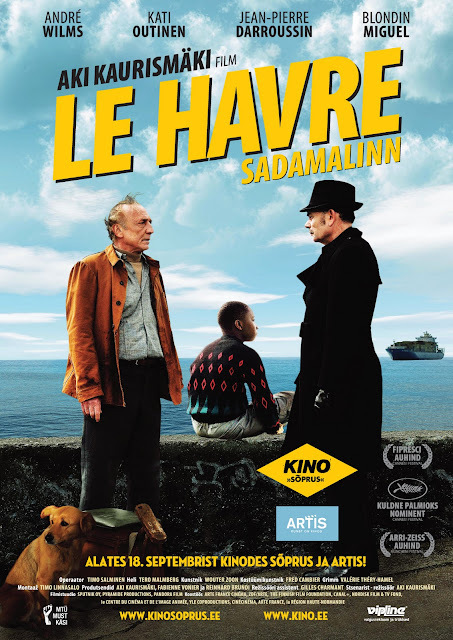 Le Havre translated to English literally means 'The Haven' and Kaurismäki takes full advantage of this double meaning to showcase the city and the safe haven it becomes for young Idrissa; well the specific parts of the city which fit his artistic vision. An idealistic world with 1960's aesthetics but modern sensibilities. Well hidden are the high tech bridges and architecture that the city is famous for, instead we see old streets and eroding buildings, and like in La vie de bohème classic cars mixed with new models to form an anachronistic atmosphere. Also true to his form, the names of every character in the film seem to be a direct nod to either historical, cinematic, or literature figures. Kaurismäki's directorial style is one you'll either love or hate. The story takes place in an alternate reality filled with eccentric characters who spout one-liners in bizarre cadences, and mundane situations that elicit roaring laughter. One such scene has a police inspector purchasing a pineapple and walking around. To describe it sounds absurd, but seeing it on screen had the entire audience chuckling. There is also the oversimplification of serious social and political issues, on one hand it makes for a playful, optimistic, and heart-warming film, on the other hand it could be seen as childish or naive. 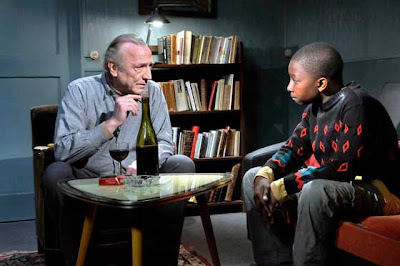 I think in this messed up world, it doesn't hurt to have an intelligent film that shows a bit of love, respect, and tolerance for one another, whether they be a downtrodden old shoeshine man, hard nosed detective, or illegal immigrant, and Aki serves us a charming and humorous modern day fable that does just that. 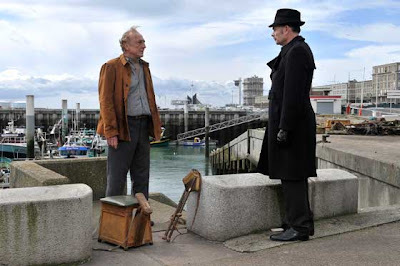 I just rented LE HAVRE on iTunes ... after your highly positive review I'm looking forward to it. I've heard a lot about this film and I am eager to watch it. I seen a review of this film on Filmmaker magazine last year and have been curious about it ever since. Thanks for the review! Haha to be completely honest, the audience in this case consisted of me and maybe 5 or 6 others who were mostly middle aged women who probably understood enough French to get it. It sounds like this one has a pretty good chance of getting nominated at the Oscars, and actually has an interesting story to boot! Comedy is often one of the hardest things to be able to cross the language barrier, so if the audience was laughing (particularly at one liners), that's a great sign. By trailer alone I'm loving the the style. The story to go with it? Sounds great too. Looking forward to it! Nice write-up! I might check it out since I came in theaters lately! I have been looking forward to seeing this for a long time now. Ever since Anna did a feature on this director on the FRC Icon World tour!! Alright. Well, I said I'd come back once I watched the film. And here I am. I think we know too little about the kid, which consistently kept me from caring about him (even though I still somewhat did). Enjoyed the elements with Marcel and the people in the small town. And speaking of the small town, what a great configuration of an atmosphere. The two act narrative structure between the attempt to save this kid and the wife's attempt for survival, didn't quite gel too well for me. Overall, I enjoyed it. Evocative storyline and fantastic acting. Thanks for coming back Sam. I'm not sure that we need to know the kid's history in depth to care for him. He's a kid who is lost and alone in a strange land, and that's enough for me. 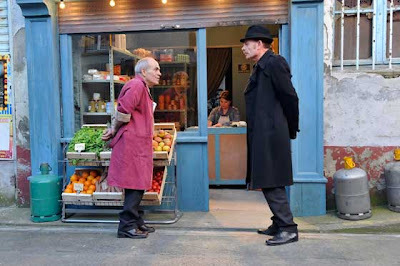 The small town colorful details and atmosphere is a trademark of Aki's so if you enjoyed that, I highly recommend seeing some of his previous films. Check out the adventures of a younger Marcel in La vie de bohème. I loved it because it made me feel good. Sure there are tons of movies that do this, but those all feel very manipulative, this one despite its fairy tale nature rings true and it's refreshing to see. Criterion posted their three reasons trailer for this. I wasn't too interested in it before, but with your promising review, I'm more interested in it. Ah that trailer totally makes me want to see it again. I usually hate on Criterion for releasing recent films, preferring them to keep to the older neglected and forgotten titles, but I'll make an exception for this.